Merck got handed its fanny today as Vytorin demonstrated no benefit over generic simvastatin in reducing plague in the carotid arteries. Merck knew the repercussions of this trial - and this likely was the reason its reporting was delayed: profit. Stupid, really. Drug companies, in dire straights to rectify their relationship with the public, sided with their short-term monetary gains rather than improve their long-term public perception of the industry. So now, we are left to wonder, what was that gain compared to generic simvastatin? Turning to our handy-dandy CostCo cost analyzer, we find that a 30-day supply of Vytorin 10/20 (one of the lower-dose sizes), cost a whopping $97.17. Compare that to generic simvastatin 20 mg, at $5.82 - nearly 17 times the cost. But that's not all. Let's not forget the cost for your time to call your doctor and change the prescription. Or the costs involved at going to the doctor's office in person and getting a new prescription written. Costs that both you and your doctor have to absorb. Costs that cut dearly into your precious 7-minute primary-care visit. And this cost is not inconsequential, especially when we realize that there were "1 million prescriptions written for it weekly." LDL's were significantly lower in the vytorin group. Is lower LDL really better? That's one million appointments to the PCP weekly, unless of course they want to eat the time charge. I suppose a little more volume wouldn't hurt. Just take it onto the other 30 patients on the schedule per day. The more we know, the less we know. I'm holding my fire until the dust setttles. If I understand the news report correctly, this was a plaque regression study. (I still need to read the study for myself!). Plaque regression studies, as you probably know, have highly variable outcomes and don't always predict events. Just go to medline and search the literature for plaque regression (as measured by angiography, MRI, CT, ultrasound, intravascular ultrasound etc etc) and a variety of statins. Regression is not well documented for most. There are a bunch . . .And these are only the negative studies that the literature was willing to publish. Studies with a negative ("no effect") outcome are hard to get published. Yet look at hard events for statins and a different story comes out. It's not the size of the plaque, but its stability and composition that matter in terms of future risk of rupture (and therefore future risk of myocardial infarction and stroke). Well said. Here's what the ACC said in their "official statement:"
The ENHANCE (Effect of Combination Ezetimibe and High-Dose Simvastatin vs. Simvastatin Alone on the Atherosclerotic Process in Patients with Heterozygous Familial Hypercholesterolemia) trial results were released by Merck and Schering-Plough Pharmaceuticals on January 14, 2008. The results of the trial show no benefit from the combination of ezetimibe (Zetia) and simvastatin (sold together as Vytorin) over simvastatin alone in terms of affecting the rate of atherosclerosis progression. The study involved 720 patients with heterozygous familial hypercholesterolemia and showed no significant difference in the primary endpoint between patients treated with ezetimibe and simvastatin versus patients treated with simvastatin alone over a two-year period. 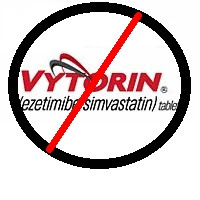 The study was designed to prove that Vytorin could slow the growth of plaque in carotid arteries supplying the brain more than simvastatin alone. Media reports indicate that the results of the trial show no benefit from the combination of ezetimibe (Zetia) and simvastatin (sold together as Vytorin) over simvastatin alone. According to the American College of Cardiology (ACC), this study deserves serious thought and follow-up. The overall incidence rates of cardiac events were nearly identical between both treatment groups, and both medicines were generally well tolerated. There should no be reason for patients to panic. The difference in IMT changes between the simvastatin group and the Vytorin group was 0.006 mm vs. 0.011 mm. Health care professionals should speak to their concerned patients using this drug. The ACC is also releasing a public statement explaining that this is not an urgent situation and patients should never stop taking any prescribed medications without first discussing the issue with their health care professional. Further research will be needed in this area to provide conclusive evidence about which lipid lowering strategy is preferred (statin alone vs. statin plus ezetimibe). Furthermore, the ACC notes that this trial is an imaging study and not a clinical-outcome study. Conclusions should not be made until the three large clinical-outcome trials are presented within the next two to three years. The ACC recommends that Zetia remain a reasonable option for patients who are currently on a high dose statin but have not reached their goal. The ACC also notes that Zetia is a reasonable option for patients who cannot tolerate statins or can only tolerate a low dose statin. Reports also indicate that the ENHANCE trial has been submitted as an abstract to be presented at the upcoming American College of Cardiology Scientific Session in March, 2008. The late-breaking clinical trial selections by the meeting co-chairs are scheduled to occur in late January. For more information on the ENHANCE trial, please visit Cardiosource at http://www.cardiosource.com/clinicaltrials/trial.asp?trialID=1640.